Praxair / Liquid Carbonics / Cryogenic Systems Equipment, compack, stainless steel, cryogenic, LN2 (liquid nitrogen) freeze tunnel with amount of product per hour – depending on materials and application. 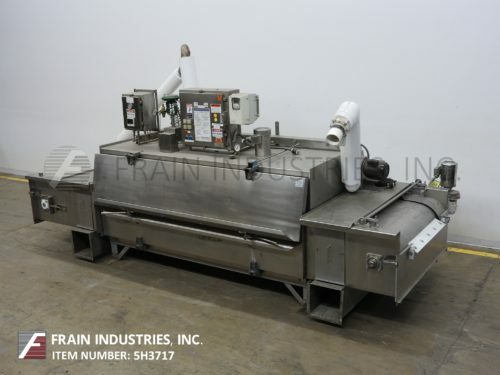 Equipped with 107" long freeze tunnel and has 36" wide x 3-1/2" high total aperture with dual 107" long flip up side access doors one each side with (2) sets of (7) liquid nitrogen inner chamber spray nozzles and (2) inner chamber circulation fans with a 107" long x 34" wide stainless steel solid flat band product conveyor belt with 36" high in feed and discharge chutes and top mounted LN2 (liquid nitrogen) injection panel. Control panel has ABB controllers with spray system and fan on / off switches, pressure gauge with 0 to 210 psi and 0 to 30 Hg vacuum ratings. Mounted on a heavy duty stainless steel base frame. 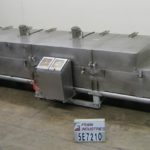 Cryogenics System, high capacity, cryogenic, 36" wide x 22′ long, C02 freeze tunnel, with freezing capacities from 475 to 3500 lbs through product per hour – depending on materials and application. 304 stainless steel construction. 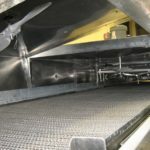 Equipped with (3) 60" sections with pneumatic flip up, clamp down covers, First (2) sections are the blizzard sections, which provide a controlled blizzard of C02 vapors and snow, with interior C02 spray nozzles, and the last section is the equilibration section, has a 36" W x 22′ L S/S mesh weave product conveyor belt, with a 36" in feed / discharge height. 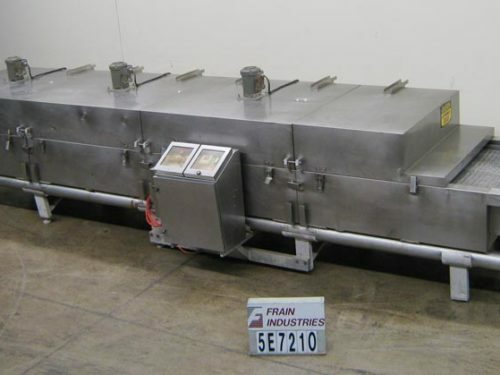 26" of product in feed load area, 18′ of freezer area and a 2 3/4" H clearance into tunnel. Has (3) 1 Hp variable speed, electric re-circulating top mounted chamber fans and side mounted automatic temperature control cabinet. Mounted on heavy duty base frame.